Talk about air pollution, water crisis or any other environmental problem, and someone will inevitably say, “Education is the answer.” How can you disagree with that? But I wonder if people know about the role education can play and the problems it faces in the process. 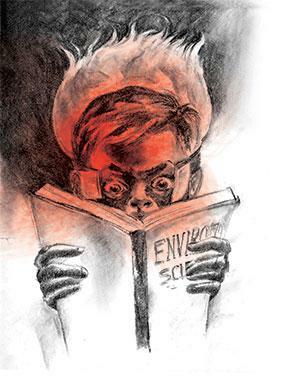 Over the past 30 years, considerable effort has gone into introducing problems of the environment in the school curriculum. There are two main reasons why the effort has not impacted much—the first has to do with the larger ethos and the place of education in it, while the second lies in the system of education itself. Let us start by looking at the first reason, recalling that the time during which environment-related concerns began to find space in the curriculum was also when economic policy emphasised increase in consumption to improve economic growth rate. Let us be a little more specific. The first wave of curriculum reform based on the National Policy on Education, 1986 began to make its presence felt in schools in the early 1990s—exactly when liberalisation and globalisation became the dominant dis-course of the economy. While textbooks and teachers tried to persuade the young to con-serve, the economic environment influenced people to buy, consume and dispose off. Nothing illustrates this state of affairs more sharply than the message announced at the end of every journey of the Shatabdi Express trains: “Destroy the mineral water bottle or take it with you.” A few seconds later, one would hear a crackling sound all over the compartment—a resounding proof of the compliant, middle-class culture that education has helped in promoting. Let us now turn to the second reason. Those who destroy the bottle act like good citizens who obey whatever the State says. Neither their upbringing nor education has trained them to apply their minds critically, else they would be concerned about the future of that crumpled plastic bottle. Had their teacher taken them for an excursion to the 60 metre-high mound of garbage at Samaypur Badli on the outskirts of Delhi, they might have spotted crumpled bottles burning away slowly, adding to the poiso-nous smog of the nation’s capital. The train example shows how the two reasons I have cited work together. They tell us why environment education fails to cope with the scale at which the environment crisis is growing. The social and economic ethos impels citizens to be reckless and indifferent towards how debris of their consumption is disposed off. So long as garbage is removed from the vicinity of residential areas, few care about where it goes and what is done to it. Conservation of fuel and electricity is also propagated, but that persuasion is a lot gentler. As for caring for the wider geography, including rivers, forests and mountains, there are a few scattered examples of hard measures being taken, but they are not enough to counter the reckless destruction. Nothing illustrates the latter better than the Art of Living fest held in the Yamuna floodplains in 2016. The National Green Tribunal could not stop it and when it imposed a fine, it was grudged. If we expect school education to overcome the impact of such examples set by society’s venerated leaders, we must revisit our notions about education. It cannot work in isolation. Nor can it work like magic which is what people widely believe it to be. It is expected to cure every ailment, be it the malfunctioning of democracy, the decline of values or the environment crisis. It is true that there is widespread dissatisfaction with our education system which finds seasonal expression every year—once in January at the time of nursery admissions, then in March around the Board exams, and finally in July when college admissions take place. If we examine this sporadic discontent, we will grasp the individualised nature of the expectations people have from education. This kind of concern cannot translate into pressure for reforms in the system. And that is what might help in making education capable of creating common, yet deep, anxiety about the crisis related to the environment. For school education to make a difference in a matter like environmental protection, they will need to have real-life opportunities to engage with problems arising out of the present crisis. Such opportunities mean two conditions: local inquiry, and they be given as much importance as exam-related work. These sound like asking for the moon. However, a fine example already exists in the form of the Green School Programme initiated by the Centre for Science and Environment a few years ago. The project is an annual activity-based environmental audit as part of which children assess the school infrastructure and sources of en ergy. Careful record-keeping and well-organised monitoring have made it a great success story. There are other similar stories, but the education system continues to be too rigid to assimilate them. Efforts to create greater space for dynamic work on environmental education have failed to take root. One such major effort was mooted by NCERT (National Council of Educational Research and Training) in 2009, with the publication of project books for different levels. These are not textbooks, therefore, they hardly sell. They offer hands-on experience, but carry no marks in an examination (NCERT doesn’t conduct exams). There are few takers for such ideas in our school system. At the undergraduate level too, the scene is not very different, and no one seems to be particularly concerned. That, I feel, is the real problem. Delhi presents a similar case. Residents say they are concerned about air pollution, but it does not reflect in their actions. Getting sick every now and then is accepted as life’s reality. An equilibrium has been reached between occasional alarm and routine apathy. Educational effort can’t break it or make an immediate impact on it. Nor can education by itself settle the conflict of interest. Public awareness and anxiety on environment issues will have to rise to a much higher level before the interests vested in polluting industrial production and exploitation of scarce natural resources can be effectively challenged. As a means of bringing long-term change in public attitudes, education demands radical improvement within its own system. Today, it is too weak to serve as a means of fighting the crisis of environment which is getting graver and deeper by the hour. I agree that today's education indeed demands a radical improvement to generate awareness not only about the environmental issues but also other social issues. And I also agree that we need to have real-life opportunities to engage children with real problems. But there is a reason why such ideas do not form part of the schooling experience. According to me, our education is indeed exam centered, but broadly speaking is 'Knowledge centered'. Our curriculum and syllabi essentially contains what the children ought to 'know', not what they ought to be able to 'Do'. We are not 'Work centered'. So in this framework, children get awarded for what they know, not what they do. So we the people of India know that plastic is harmful to the environment but we are not taught how to act towards it. And this knowledge centered curriculum which ask our children to live in some imaginary world, does not develop enough critical thinking capacities that we can question the acts of profit minded industrialists.